Apps like Pandora Radio and AOL Radio have brought the wonders of commercial internet radio to every iPod Touch and iPhone. Given their success, it was only a matter of time before the established name of satellite radio made its debut on our favorite gadget. The problem is that the iPhone and iPod Touch hardware, by itself, isn’t capable of directly receiving a satellite radio signal. To fix that, SIRIUS XM Radio has announced the XM Skydock, a $120 accessory that allows any iPod Touch or iPhone to receive the benefits of a commercial-free XM radio subscription. The Skydock works with the free XM Skydock app to provide a pleasant, touch-friendly interface to browse through XM radio channels. The app will store up to 12 of your favorite channels of commercial-free music, live sports, news, and exclusive XM radio content on the app’s home screen. The home screen also provides easy access to tagging music and XM traffic and weather reports in the United States’s 20 most congested cities. You can be browse through your tagged songs at any time to set up alerts, see if any are playing right now on XM radio, or purchase the tracks immediately from the iTunes store. You can attach the Skydock to your car to provide an easy charging station and stream audio to any FM radio with the FM transmitter (XM radio to FM radio? Yikes!). Fortunately, if there’s too much interference via FM radio, you can use the supplied cables to plug the Skydock directly into your car or any other device that has a minijack in port. 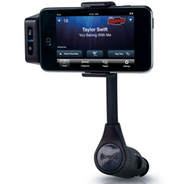 The XM Skydock requires an active XM subscription and an iPod Touch or iPhone with OS 3.0 or later and is only available in the United States. The XM Skydock app is available now from the App Store, while the XM Skydock adapter can be bought from retailers such as the Apple Store, Best Buy, RadioShack, and shop.xmradio.com.